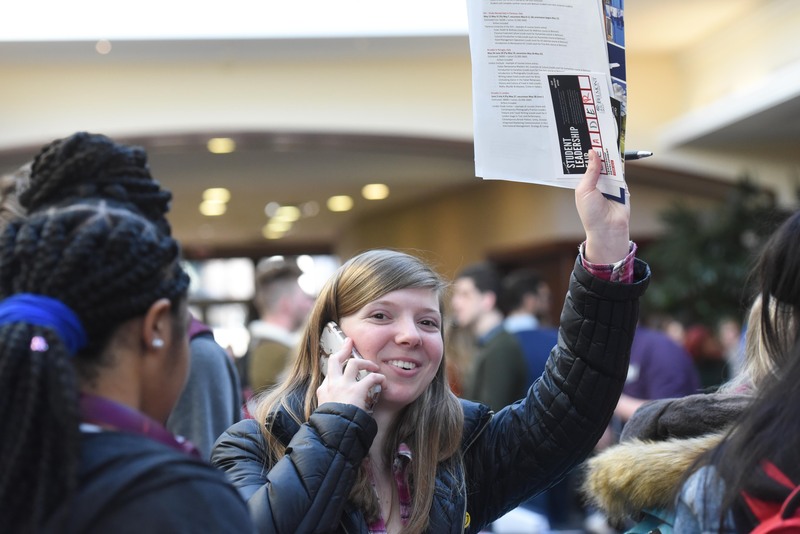 A group made up of 74 representatives from 33 Belmont offices, departments, centers and all academic colleges participated as exhibitors in the event, double the number of representatives from the 2018 Fair. Exhibitors were pleased with both the turn out, as well as the engagement with student attendees. A representative from the College of Law commented on the recruiting potential the Fair provides as undergraduate students begin thinking about their time after graduation. “This is a good opportunity for us to connect to Belmont undergrads for recruiting purposes,” she said. Their table recommended students become more active in the Pre-Law Society to gain meaningful leadership development experiences. Up from 154 participants in 2018, 217 Belmont students attended the fair and met with at least seven departments, offices, centers or academic colleges to discuss leadership opportunities. Students signed up for opportunities with BOLD, University Ministries, Belmont on Mission, Study Abroad, Multicultural Learning and Experience, the Office of Career and Professional Development, service-learning SAPB, SGA, FitRec, Enactus, ODK, Towering Traditions and more. Students from across campus where given the chance to learn more about leadership development opportunities in every Belmont academic college. Social Change & ME, a three part leadership development experience, is up next for all Belmont students interested in further leadership development this semester. Registration begins on Friday, January 11. Additionally, supplemental leadership development experiences, through BOLD, have been planned for the entirety of the semester. The 2019 Fair was a student-led effort presented by BOLD Team Leaders through the Division of Student Affairs and in partnership with others across campus. Leadership development across campus for each college, office, department and center are listed in detail on BOLD’s website and in Bruin Link, here.